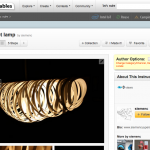 I finally got to making an instructable about how to make a Nest lamp. With the support from Cultuurplatform design I was able to bring the design to a higher level by making a new and improved prototype. I also worked on a grasshopper version for different dimensions and shapes. I started the definition when being a novice Grasshopper user, so I’m pretty sure I would do some things different if I would start over now. But overall I’m quite happy with the result.